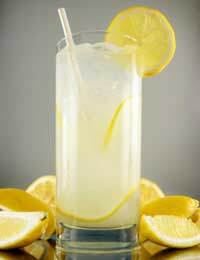 Lemonade is a tangy, refreshing drink that is really easy to make yourself. In addition, it’s also very cheap to make and won't contain any of those chemicals whose names you can't pronounce. You'll need: a vegetable peeler, a lemon juicer, a pan, a sieve, chilled jug, glasses, wooden spoon. Step one: Firstly you will need to zest the lemons. Take the vegetable peeler and carefully remove the lemon zest, but leave the white pith on the lemon. You will need to retain the pith. Step two: Juice the lemons, removing the pips as these can taste bitter. Step three: Put the lemon peel, juice, boiling water and sugar into a pan and stir until the caster sugar has dissolved. Make sure there are no gritty bits of sugar left or this will spoil the texture of the lemonade. Step four: Strain the mixture through a sieve. Step five: Add the cold water. You can add still water or fizzy, depending on your preference. Step six: Test the lemonade to see if it is sweet enough. If not, you can gradually add more sugar. Step seven: Pour the lemonade into a jug with ice, mint and lemon slices. You can also try making pink lemonade for a twist on the traditional recipe. Why not bottle it up and give as a pretty addition to a gift? Step one: Put all the ingredients into a pan and add the water. Put the pan on a low to medium heat. Step two: Bring the pink lemonade recipe slowly to the boil, taking care to stir it regularly.Step three: Once the lemonade mixture has come to the boil, remove it from the heat and allow it to cool. Step four: Strain the mixture. Squash the mixture through the sieve to get as much flavour as possible from the fruit. Step five: You can now add water to the syrup. Add still or sparkling depending in your preference. Step six: Add ice, slices of lemon and raspberries, as well as mint sprigs. Rose lemonade is a slightly more elegant take on the classic lemonade. To do this, make the classic lemonade recipe as above but also add the petals of 10-12 roses and two drops of rose essence. Wash the petals very thoroughly before you use them. Pour 500ml boiling water over the rose petals and allow the mixture time to infuse. Leave it for around two hours if possible. Once the water is cooled and fragrant, strain it through a sieve. Then add this to the 500ml of lemonade from the first recipe. Add rose essence to taste. You can make refreshing lemonade ice lollies by adding to moulds and freezing. You can also freeze the fresh lemonade to make it last longer. If you are not freezing it, fresh lemonade should be drunk within around three days. Ice cubes made from the lemonade make a refreshing addition to drinks such as tonic water, or gin/vodka and tonic.